End of Summer Storm Warning! Woo Hoo! 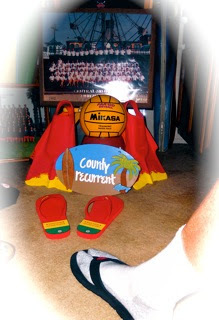 • "County Recurrent" says: "Bring it!" • Surfline.com says: It's on it's way! 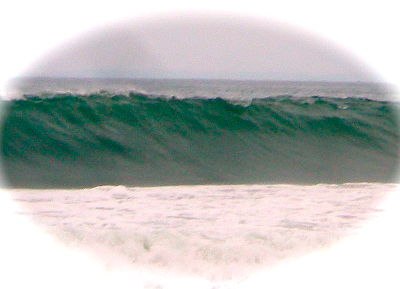 "According to Surfline.com's forecast for northern Los Angeles, surfers would see 2 to 3-foot waves Wednesday. However, on Thursday and Friday, the forecast showed a south-southwest groundswell with waves reaching 5 to 7 feet, according to the site." The biggest waves are expected Wednesday through Friday, but higher than normal surf is predicted through the Labor Day weekend. "The surf at El Porto today was 4-6 feet with bigger sets. Captain Tim Arnold said he saw a 15 foot face at Manhattan pier, and that the body boarders looked liked ants scurrying up the face. Matt Phiefer had a rescue at 5:00 at 30th street that went out past the length of Manhattan Pier. The baywatch picked them both up and put them on the inside between sets. Then there was a Double rescue just as far out at 45th street in Manhattan at 6:30 pm. Gregory Martinez a recurrent and the permanent Darin Nelson rushed down there code three both making the rescue. The rip looked like the Russian River with 2 foot peeks and valleys as the brown sand filled water in the rip rushed back out to sea. Martinez said he only had one fin and got pounded on the inside while Darin had two fins and bolted through the 8-10 face sets. Captain Tim Arnold code three backed them both up, and Baywatch was Johnny on the spot to pick up both victims and lifeguards. I moved down to Rosecrans from 34th street to cover Darin's water. Then again, the Baywatch ran by skipper Rob Pelky, and deck hand James Goldsmith did what they had been doing all day so well. Waited for the sets to subside and dropped both victims and lifeguards off on the inside just before another monster set came in. Good job guys. Martinez said he is wearing two fins tomorrow, and getting a good night sleep. So break out your Fins, both of them, boys and girls! And be sure to wear them if you are going to venture into the ocean over the next 4 - 5 days. Surfs up! JG Road, er, Boat Trip to Avalon! "How classic is this? We went to Catalina yesterday. This sign was posted at the VERY CROWDED public beach!" Groupon. We did some great snorkeling... we went out at Descano Beach Club and swam North. I was amazed at what we saw underwater!" All photos by & Copyright Nathalie Brouwer 2011. All Rights Reserved. Used here with permission. Many Thanks to Nathalie for sharing this JG Adventure and visit with one of LACo's finest, Recurrent Lyndsi Worthington. 10-4. Just in from LACo veteran recurrent, Dave Clarke, who was the first responder on scene at the North Channel location of the sea lion attack on an elderly man this past Thursday evening, Aug. 25, 2011. The day is closing, its 1920 hours. station detail has begun. Bino check the area up and down, reflecting on my average day at Top Sail for stat report. A jogger runs up and reports a woman attacked and bitten by a seal. Another bino check, I see a woman in pink sitting on the berm half way to North Channel with two bystanders. After my call to the pier, I grab the med box and head out........... As I approach a clearly distressed woman in her 60s, seeing no visible wounds or blood. She lays into me with "where the hell were you while I was being attacked and nearly drowned"??!!!!!!!! "Why aren't you out there saving him"???!!!!!!!! among other things, #@5$$&^**er. I looked out and saw the old guy who swims almost every day in his usual flail style stoke. Nothing appears to be out of the ordinary. Moving down to assist him out of the surf line, he emerges from the white water and glare, blood flowing from his temples, an avulsion on his forehead. Not panicked not calling for help. I was stunned at the man's condition and calm demeanor and as I reached for his arm I noticed the web of his right hand had a puncture large enough for a # 2 pencil, and possible crushed carpals. I bring him up to the berm and noticed more bite marks and holes in his wet suit. Unzip to examine: Bites to the right and left shoulders, Punctures to his back, ribs and lats. Holes and bites to his left hip. Holes and punctures on both arms. Probably 30 or more contusions. He was so LUCKY that bull sea lion didn't rip an artery or tear the groin or blind him with those brutal face and cranial attacks. Tito 231 on scene with immediate purge and gauze pressure wrap applied. R200 call car rolls up for vitals and transport. Capt Horne on scene to secure and conclude. This attack took place 100 ft. past the surf line in just a few minutes, to a man who swims regularly with and without his wife. This guy saved himself, and has my admiration. I saw no struggle, no sea lion, or any sign of injury, until he emerged. 34 summers of watching the water........Take nothing for granted in the ocean. Many thanks to Dave for sharing his experience about this unfortunate event. A great example neverthless of the swift treatment of this citizen by LACo lifeguard personnel. 10-4. Swim Coach Job Opening in Malibu! Westside Aquatics Malibu, CA is looking for an experienced Head Coach. Westside Aqautics is a competitive, year round swim club that trains at Malibu High School. The ideal candidate will possess: a minimum of 2 years of coaching experience (USA Swimming, high school, or college): a clear understanding of the importance of stroke development and correct technique; the ability to manage the day to day tasks of a swim team: the ability to work with a variety of ages and levels of swimmers; experience managing assistant coaches; Level 3 ASCA certifications or equivalent experience; ability to coach swimmers to or beyond the Jr. National Level. Compensation will be commensurate with experience. Interested candidates should email a cover letter, resume and at least 3 personal references relating directly to previous swim coach experience. Emails should be sent to: adamblakis@gmail.com. Just in from LACo Lifeguard Captain (Ret. ), Roger Smith, another gem of a story that is both gripping and action filled... for your reading enjoyment. It was 1970 at Huntington Beach, California. Wide World of Sports was presenting the National Surf Dory Race Boat Competition. In the competition are there were twenty teams, all ocean lifeguards from along the coast, some traveling over a hundred miles to be in this competition. There he was, Jim McKay, on a stage with television cameras on the beach, talking about the history on the surf boats and how the lifeguards used them to make rescues off shore before the motorized power boats replaced them. Now the lifeguards mainly use them for competition against each other. There I was, along the shore, holding my dory in the lane after the draw was made. The surf was very large at times and cracked with great authority as the inshore current swept towards the very long fishing pier. The race was two laps around the pier; all of us knew it could get physically dangerous for us and we might lose our boats if we should slam against the pylons underneath. I looked on down the line of boats; most of them were ones I had raced against all year. They were all members of the National Dory Boat Association. But the season was over now, it was September and this was the last race of the summer. I see my old partner Randy from the '69 season; he was only a few boats down the line from me. We were undefeated in that season and broke up to row the present season, we just could not agree on things and got new partners this year. Unfortunately he beat me in most of the races this year. I got third place over all. I think my new partner just did not have the killing aspect for competition, so I got another dory man I knew named Mike Buscher for this very special race. Maybe I will be able to show him who the best dory man is after all. We were just a few minutes from starting the race, all of the bowmen were up at the starting line on tops of the berm in the soft sand. The gun went off and they came running down to get into the boat. As I pushed the boat off, I slid over the stern and slipped my oars out into the water and started rowing. Many of the boats were already running into each other as the lateral current swept them along the shore. I managed to stay clear of most of them and started to row through the surf. Some of the boats were getting too close to the pier and starting to collide. You could already hear the noise of some of the boats being damaged. The pier was loaded with spectators as we rowed toward the end and started to make our first turn left. I found myself in first place. Sure enough, as I looked back before making my second left turn to round the pier, I noticed my old rowing partner was running in second place. I had a good lead but I had to make a very important decision on where to come ashore to make my turn around on the beach. The shortest distance was next to the pier, but I would have to worry about hitting it and other boats as they came ashore. I did know that if the current was sweeping toward the side we started on, then in most cases the current would be sweeping offshore on this side. This could cut down on some of the waves that were coming in and I might be able to sneak back out. My ex-partner decided to row further up the beach where the surf was not as large, thus avoiding the other boats. We were able to miss the other boats coming in through the surf as we rowed back out. We were about half way out along the pier when I heard the crowd yelling very loud. I looked around toward the sea and I saw the largest wave starting to curl at the top. I told my partner not to look around and to pull as hard as he could. The dory started to climb up the wave, I do not know how big it was but the dory is 20 feet long and we were straight up and down. The top of the wave proceeded to break into the boat, and it took all of the power we had to hold it in position until the water drained out the scupper holes on the sides. After several minutes of sheer terror we proceeded to row to the end of the pier to start our turns. Sure enough as I looked up the shore there was my old partner about one hundred yards behind. I thought, "No problem, I have enough lead to still finish first." As we headed for the finish line I kept yelling at my partner not to let up, and to keep pulling as hard as he could. As we were only about a hundred yard off shore I looked back and saw my old partner starting to catch a swell that was developing into a wave. At first I did not think he was going to pull it off, he might broach and flip. But there he was dropping into the wave and the next thing I knew we were side by side on the same wave racing toward shore. As we got closer to shore we were getting our bowmen ready to have a foot race up the beach. The dory boats were now in the soup of the wave roaring toward the beach. As the water was getting shallower, I yelled at my bowman to stay in the boat until I told him to go. Just then the other bowman did not wait and jumped from their boat and landed in chest deep water. My bowman held off and landed in ankle deep water and sped up the beach to the finish line. "ABC Wide World of Sports", Copyright 2010 Roger Smith. All Rights Reserved. Used here with permission. Wow! How's that for edge of the seat excitement!? This story and others are featured in Rogers self published book entitled, September, named after his 41'sailing ketch built by Islander Yachts in 1975. Roger was born in Los Angeles in 1944 and grew up in the San Fernando Valley. He was recognized as the "Athlete of the Year" his senior year in high school as a swimmer. He later swam at Valley College and that is when he took the LACo Ocean Lifeguard test after responding to then Lieutenant Burnside's swim meet campaigning for talent. Later he married his high school sweetheart, Linda, to whom he is still happily married. He next became a Santa Monica City permanent beach lifeguard and worked with Tom Zahn on the rescue boat. Later he returned to LACo and operated rescues boats for them and becoming, along with John Stonier, the first ever Paramedic-Lifeguards. 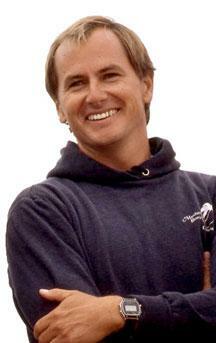 Roger also became a hyperbaric chamber treatment supervisor at the USC Facility on Catalina Island. Roger retired in 1999 after over 36 years of service as a lifeguard for L.A. County. Roger and Linda now live in Oakhurst, California and Rogers says he is very happy living in the mountains. Many Thanks to Roger for sharing yet another great story with all of us. The challenge is still on for a great many of our alumni, who avidly soak up and enjoy these stories, to contribute a story of their own for publication on "County Recurrent". Pay it forward. We need your participation to keep this dialogue going. So bring it on! It was my second year as an ocean lifeguard at Zuma Beach. Becoming a lifeguard solved two major problems for me at the time. I got good pay and a place to live. The County would let the guards live in the headquarters because Zuma was far out and hard to commute to. We had two places to stay, down or upstairs. Each area was a large room that had bunk beds in them. The bunks would always be inspected to see if they were made up properly with forty-five degree corners and tight. We had to be up and out by seven. The night guard worked until midnight, so we were all civil. But there was a lot of playing tricks on each other and we always had to be on guard. The kitchen was a favorite place to try and keep track of our food, and make sure it was edible when we needed it. One of the guards would sleep walk and he was a victim of a cold bucket of water as he walked along. The guards were from all walks of life. We had everyone from girl chasers to one guy who we called the “Reverend” Mr. Black. My bunk was up stairs and one August night we all went to sleep and the night man went home. At day break the windows were shaking real bad. We could hear a crashing sound coming from the ocean, but could not see it because the fog was so heavy. As we stood there looking out the windows the fog started to thin. And there it was; the waves were so big it was hard to believe. All that you could see was one after the other in very long lines as they crashed on shore. The waves were from the south and we found out they were from a hurricane off of Baja, California. The permanent day crew came in and told us the waves were ten to fifteen feet and no big deal. I think they did not want to panic us, it was summer and the beach crowd would be on their way. I was unlucky to be assigned the lifeguard station number one on that day and that is where the surf was the largest as it marched down the beach with great authority. You could feel the ground shake the tower. The waves were the largest on the beach, sometimes twenty foot walls. I did a lot of walking the shoreline; keeping people very close and advising them not to go very far out. I was sitting on my chair at the tower when I looked to my right and saw a man in waist deep water, the current started to move him along the shore so I started down the beach in his direction. The man was picked up by the current and pulled into a rip current and raced out to sea. I knew I must try to get out to save him. I hit the water and was met by a pounding shore break and current. I worked my way out and was not in the same rip current that he was in and was met by the huge walls of water. So, as trained I decided to try and go under the waves. I went as deep as I could, but my rescue buoy would pull me back as the waves hit me and I could not touch the bottom to hold on. When I came up for air, the foam was so thick I could not take a breath with out sweeping my arms first. And then there was the next wave, and this went on for many times. I thought that I may never get out and I did not. 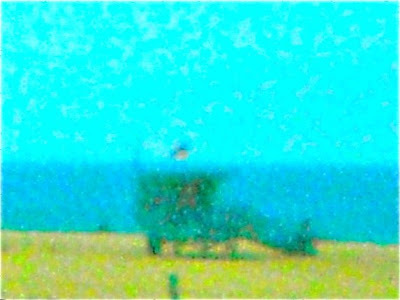 When I got back on the beach the guard in station number two came down and was wondering what was I doing? He never saw the victim I was concerned about and never saw me because the foam was so heavy. So I went back to my station and called the headquarters, and they did not know about me either. I told them I saw a swimmer get dragged out to sea. So they sent the rescue boat on down off my station and sure enough they picked up my victim. They told me not to come out. They took him to Paradise Cove pier to drop him off back ashore, the rescue truck went to pick him up and bring him back to Zuma because it was just too dangerous to bring him back through the surf. The rest of the day went okay as people were mostly scared to enter the water. The next day the surf was not as big but it continued to cause huge rip currents. I was more in the middle of the beach and was making so many rescues I never got back to my station all day. At the end of the day I had made over thirty rescues. The total number for Zuma was 437 rescues. This has been the record to this day. The surf has not been that large in many years, the hurricanes have not developed in the same way as in the sixties. Of course the guards at Zuma just think we are just telling stories. But that record is still in those old log books. 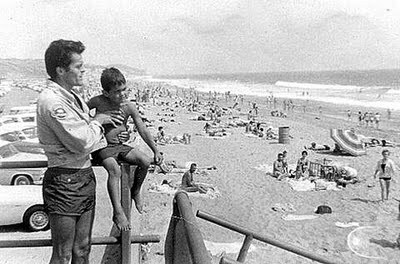 Roger Smith - Zuma Lifeguard 1963. Copyright 2011 Roger Smith. All Rights Reserved. Used here with permission. Wow! Many Thanks to Roger for sharing this great story from back in the day at Zuma Beach. Hopefully, this story will underscore the power of Mother Nature and the challenge we all face when we are presented with these kinds of daunting surf conditions. And we also hope our other alumni will share their stories with us. We have alot of alumni, as well as active guards that are starving for content and lifeguard related stories. So step up. It is your individual and collective duty to inform and entertain your colleagues. Are you up to this obligation and challenge. We think so. So bring on your stories as we want to publish them. You retain all rights. We are not going to take credit for your stories or photographs. In fact, we want to promote and champion your victories and successes, as well as those of your colleagues. Don't know if you caught this terrific profile on lifesaving stalwart and current Lifetime Achievement Award winner Buddy Bohn in The Beach Reporter. *** Thanks for the heads up, Adam ! It’s summer and time to shed the wetsuit and get ready for the 35th annual World Bodysurfing Championships. This year's event will take place August 20 and 21 at the Oceanside Pier. Heats will begin at 6:30am each day and will be ending sometime in the early afternoon. All semifinal and final heats will be on Sunday morning. Once again, we will serve lunch to all competitors on Saturday. Entry fee includes the popular World Bodysurfing t-shirt. If it all works as planned we will also have great surf. 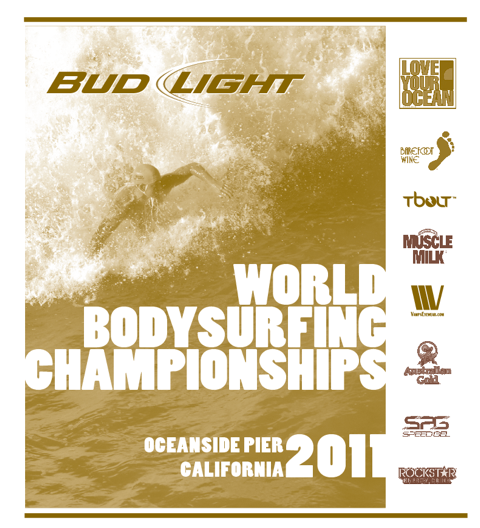 You will find an entry form attached to this email or you can get one at www.worldbodysurfing.org. Help us build the sport by sharing this link with your ocean loving friends. We welcome first-time competitors! *** ENTRY DEADLINE EXTENDED *** All entries must be received by August 18th. If you have any question or would like to judge (judges are compensated) or help in any other way please contact Tim at castim@cox.net. Thank you all for your enthusiasm for this contest and the sport of bodysurfing. LACOLA Wins 2011 USLA Lifeguard Nationals! Congratulations to the entire team ! FYI and By The Way: LACOLA has won 38 titles overall and 25 consecutive. LACo has won every year since 1986 (credit: unnamed/anonymous "County Recurrent" source). Dateline: Cape May, NJ; The Venue for this year's Nationals, Aug. 3 - 6, 2011 ! Live Results To Be Available Online! "The results will be live online. They are included as soon as the race is finished and the results are posted." LACo Central Section Wins 2011 Taplin Relay! Dateline: Hermosa Beach, Calif., Saturday Nite, July 30, 2011. Venue/Event: The International Surf Festival, Judge Taplin Bell Relay. LACo Central Section's Taplin relay team has won the Taplin Bell Trophy honors again! Congratulations to these LACo Ocean warriors who trained very hard to make this happen. Outstanding performance by LACo So. Section as well for their second place finish. And just as noteworthy was the Third Place Finish of the visiting Aussie team from Half Moon Bay SLSC in Melbourne, Victoria, esp. given that they had only 9 days to train on our American dory... and they trained on it each and every day. Their paddlers were esp. fast and clocked the fastest split of all the teams during this year's Taplin Relay and caught up to the second place LACo So. Section team by the end of the paddle segment. One Aussie paddler performed a perfect turtle maneuver under a breaking wave, popping back up on top of his board on his knees and continuing on with his paddle, stunning the crowd which after having caught its collective breath and realizing what had just happened then let out a collective cheer! Lots of excitement this nite, esp. during the dory segment. Hopefully, we can get a soundbite from the likes of Jay Butki to describe for us all here what what all witnessed during the dory leg of the Taplin with the gusting onshore wind and constant and consistent pounding shorebreak.